Just and Unjust Military Intervention is a superb collection of essays by leading scholars examining the continuing relevance of the political thought of classical thinkers such as John Locke, Immanuel Kant, Edmund Burke, and John Stuart Mill among others. Stefano Recchia and Jennifer Welsh, the editors of the volume, are quite conscious of the central issue involved in any research project that seeks to explore the contemporary relevance of classical thought. While they are sympathetic to the “contextualist” viewpoint of Quentin Skinner, which is skeptical of the idea that classic texts can be of much use to understanding the present, Recchia and Welsh believe that there are several reasons to believe that “a close reading of classic texts can enhance our understanding of intervention, in terms of both its origins and its controversial status in international society” (6). Stefano Recchia and Jennifer M. Welsh. 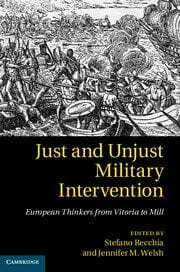 Just and Unjust Military Intervention: European Thinkers from Vitoria to Mill. Cambridge: Cambridge University Press, 2013. ISBN: 9781107042025 (hardback, $99.00). © Copyright 2015 This work is licensed under a Creative Commons Attribution-NonCommercial-NoDerivatives 4.0 International License. H-Diplo/ISSF thanks Professor’s Recchia and Welsh and all of the reviewers for advancing an important debate over the continuing relevance of classical political thought on military intervention. Stefano Recchia (Ph.D., Columbia University) is lecturer in international relations at the University of Cambridge, UK. He has held fellowships at the Brookings Institution, Harvard’s Kennedy School of Government, the European University Institute, and Sciences Po Paris. His principal research interests are in contemporary international security studies, civil-military relations, the ethics of military intervention, and classical IR theory. His first monograph, Reassuring the Reluctant Warriors, on how civil-military bargaining influences U.S. efforts to secure multilateral approval for the use of force, is forthcoming with the Cornell Studies in Security Affairs book series. He is the co-editor (with Nadia Urbinati) of A Cosmopolitanism of Nations: Giuseppe Mazzini’s Writings on Democracy, Nation-Building, and International Relations (Princeton UP, 2009). Jennifer M. Welsh is Professor and Chair in International Relations at the European University Institute and a Senior Research Fellow at Somerville College, University of Oxford. She was previously a Professor in International Relations at the University of Oxford, and co-director of the Oxford Institute for Ethics, Law and Armed Conflict. In 2013, she was appointed by the UN Secretary General to serve as his Special Adviser on the Responsibility to Protect. Prof. Welsh is the author, co-author, and editor of several books and articles on international relations, the evolution of the notion of the ‘responsibility to protect’ in international society, the UN Security Council, and Canadian foreign policy. David Boucher is Professor of Political Philosophy and International Relations at Cardiff University. He is the author of numerous books, including The Social and Political Thought of R.G. Collingwood, Political Theories of International Relations: From Thucydides to the Present, and Dylan and Cohen: Poets of Rock and Roll. Jonathan Monten is currently a Lecturer at University College London. He previously taught at the University of Oklahoma. His research and teaching interests are in the areas of international relations, international security, and U.S. foreign policy. His work has appeared in a number of peer-reviewed journals, including International Security, International Studies Quarterly, Security Studies, Perspectives and Politics, and Global Governance. Nicholas Onuf, PhD, is Professor Emeritus of International Relations at Florida International University, Miami. He is the author of World of Our Making: Rules and Rule in Social Theory and International Relations, International Legal Theory: Essays and Engagements, 1996-2006, and (with Peter Onuf) Nations, Markets, and War: Modern History and the American Civil War. The connecting thread of this collection of essays, which is implicit throughout, is the concern of classic jurists and political theorists over three centuries or so to subject conflict between states to legal constraints, whether by natural law, the law of nations, or international law. In particular, the authors of each contribution attempt to identify the arguments for constraint in military and humanitarian intervention for the purpose of illuminating and contributing to present debates (73). G.W. F. Hegel famously remarked in his lectures on the philosophy of history that the one thing we learn from history is that we learn nothing from history. The editors of this volume throw down the gauntlet, and by implication challenge Hegel’s contention. They claim that there are indeed lessons to be learned, not directly, but by shedding light on similar problems in the past that may help us to think through our own. Before we can learn the lessons we have to understand what the authors meant in and by what they wrote. In other words, a proper historical study must be undertaken to determine what was said before we can apply its lessons to current problems. What has prompted this methodological self-justification, one may ask? The editors tell us that they agree with Quentin Skinner in believing that authors have to be interpreted in their appropriate contexts to elicit their intended meanings. This they call the “Contextualist Challenge” (5), and they accept it in so far as they wish to determine whether past thinkers accepted, rejected or revised prevailing ideas and conventions relating to intervention at the time they wrote. They nevertheless think Skinner sets the bar a little too high and that it is impossible to be certain about an author’s intentions. All we can hope to do is approximate a re-enactment of authorial intentions. On a more fundamental level they contest Skinner’s purported rejection of the efficacy of classic texts for providing inspiration for our present thinking (6). As a characterisation of contextualism this is mistaken. The term re-enactment is an allusion to R. G. Collingwood, who argued that historical knowledge is achieved by re-enacting the very same thoughts as those who we seek to understand. Skinner takes much from Collingwood, and indeed calls himself a ‘Collingwoodian’, but he is quite explicit about rejecting the idea of re-enactment on the (mistaken) grounds that it rests on an intuitionist theory of knowledge. What he accepts, however, is that ideas are related to historically specific complexes of questions and answers, and therefore there are no perennial problems in philosophy. The implication of this is not that different discussions of the state, such as those of Plato and Hobbes, are discrete and unrelated to each other. Plato and Hobbes were not giving answers to the same question, but they were nevertheless related by being part of the same historical process, that is, the process by which one conception turns into another. This is the very thing that David Trim does in the first essay (Intervention in European history, c. 1520-1850). He traces the process by which one conception of intervention turned into another over a period of three hundred years. Edwin van de Haar, in his contribution, “David Hume and Adam Smith on International Ethics and Humanitarian Intervention,” takes the question of whether there is a right or even a duty to intervene “as one of the perennial questions in international relations, which in some form or another has been debated throughout the past four or more centuries” (155). Ariel Colonomos, in “War in the Face of Doubt: Early Modern Classics and the Preventative Use of Force,” on the other hand, takes the arguments of Suarez, Gentile, Grotius and Vattel on preventative and pre-emptive intervention and identifies contemporary parallels on the grounds of resemblance, as if the ideas are like coins which pass from hand to hand without losing their value. For example, he contends that Gentili’s distinction between what is meditated and what is prepared by the enemy as considerations in pre-emptive attacks “resembles debates in contemporary international relations between ‘intentions’ and ‘capabilities’” (57). The danger in comparing the conclusions of arguments on the basis of resemblance is that the reasons for reaching those conclusions are much more important and are what differentiate thinkers from each other. We may, for example, compare Jean Bodin and Thomas Hobbes, both advocates of absolute sovereignty, but the reasons they gave were very different, reflecting quite diverse traditions of thought, the former the prescriptive or normative natural law manner of thinking, and the latter the descriptive, or empirical. William Bain’s chapter, “Vitoria: The Law of War, Saving the Innocent and the Image of God,” demonstrates the importance of being sensitive to identifying the reasons for conclusions. Vitoria’s justification for saving the innocent is presented on less than one page, and it is to Vitoria’s presuppositions that Bain looks both for the reasons and justification. This requires broadening the perspective to the wider theory, and thus departing from what the editors claim, that is, that the book does not give an exhaustive or authoritative interpretation of each thinker’s international theory (11). In order to get at the reasons for positing a duty to intervene (albeit an imperfect duty) we cannot avoid delving into the wider context, perhaps not the universe as whole, but at least the political theory that sustains the conclusions at the fundamental level. Principles of intervention may be justified from a number of different perspectives and a framework of such perspectives, in my view, constitutes the appropriate context in which to understand particular arguments, but also to allow us to compare them with others. There can be little doubt, for example, that thinkers such as Thucydides, Machiavelli and Hobbes employed universal principles to consider the utility of military intervention. There are many nuances that may be added, but the fundamental assumption they employed is that of a fixed human nature in which will, and not reason, is the volitional force. Human nature, while universal, is capable of modification through human artifice. All three thinkers, for example, had different views on intervention, but the principle remains the same, what must be done is for the security of the state, not for the well-being of mankind. Power, and the danger of overstretching it, was of paramount concern. Considerations of morality are subordinate to, or conflated with expediency. Morality is made rather than discovered or apprehended. Some of these elements are well brought out by Colonomos’s discussion of Gentili, the sixteenth century Italian Jurist and philosopher working at Oxford. He justifies both preventative and pre-emptive strikes on the grounds of necessity. The prince must strike out against the roots of the growing plant. Colonomos argues that subjective, rather than objective, judgements may be used in justification of intervention and that “‘defence dictated by expediency’ may justify war based on the ‘fear that we may ourselves be attacked’”(55). The most dominant manner of thinking, certainly up until the eighteenth century, viewed the source of morality emanating from an altogether different place, outside of humanity, an objective standard, but to which nevertheless humanity was subject. According to the law, either in Plato’s realm of Being, or in Christian theology where God is the source, morality and law are not made but apprehended by right reason. It is a declaratory tradition. There is a widespread belief that reason itself takes the place of God, and that the source of obligation is rooted in the grounding force of rational argument. There is an element of this secularisation in Vattel, but certainly not, for example, in Grotius, who is said to be the paradigmatic case of the secularisation of the natural law tradition and the inaugurator of natural right. Nothing could be further from the truth. Grotius, in wanting to subject all nations to law, was at pains to ‘demonstrate’ the power of reason in discovering the truths of morality. He was also well aware that not all of us have equal capacity to discover such truths. Even the most indolent are obliged to follow the precepts of natural law, not because they are the conclusion of reason, but because they are the laws of God written in men’s hearts. Reason in itself cannot oblige us to do anything. This aspect of the natural law manner of thinking is brought out admirably by William Bain in his chapter on Vitoria. Vitoria justifies the right to save the innocent by referring to God’s command “to love thy neighbour as thyself” (71). The idea that your neighbour is part of the same moral community, and that this community transcends geographical boundaries, enables Vitoria to conceive of the American Indians as neighbours to whom we have a duty of defence against tyranny and oppression. This is consistent with his principle that the sole just cause for war is the infliction of harm. Bain contends that the character of Vitoria’s argument is generally lost on international relations scholars who tend to be blind to the theological underpinnings of his arguments (80). The same criticism may be made in relation to most natural law and natural rights thinkers. This manner of thinking has generated some perverse conclusions. While its standards are universal, in application it ends up with some rather severe judgements, in that so few peoples in the world comply with its standards, and far from being a liberating force it often turns into a tool of oppression. The perversity of this tradition certainly should have been better represented in the book. Perhaps the most perverse, and for a while quite influential, thinker was the Aristotelian scholar Juan Ginés Sepúlveda. He argues that all men by Divine command and Natural Law are obliged to save innocent victims from slaughter, on the proviso that no significant disadvantage should be suffered by the intervening force. The Indians, in his view, needed to be subjected to the government of Spain, which abhored widespread human sacrifice by the Indians, and committed itself to stamping the practice out. Intervening by waging war against the Indians was to protect the weak from enduring barbaric practices. We are obliged by Divine and Natural Law to draw back to salvation even those whose errors, knowingly or unwittingly, lead them to destruction. All sound men have a duty to drag them, even against their will, to salvation. Sepúlveda contends that: ‘the barbarians are rightfully compelled to justice for the sake of their salvation. We have a duty to intervene, then, not only to save lives, but to save souls. For Sepúlveda, crimes in breach of the Natural Law, such as devil worship, cannibalism, the burial alive of important persons and even worse, horrified civilized peoples, and justified intervention by the Spanish in order to save innocent people. On these grounds alone, God and nature confer the right “to wage war against these barbarians to submit them to Spanish rule.” The Indians should be forced to “change their lives and adopt the obligations of Natural Law.” This is a form of humanitarian intervention, with just as committed beliefs about salvation, that many extremist groups, such as the Islamic State in Iraq and Boko Haran in Nigeria, believe themselves to be undertaking. A third manner of thinking about intervention does not assume universal principles, although no thinker is immune from invoking such devices when there is nothing else at hand. Here the assumption is that conduct, interaction, trade, trust, shared practices, and elements of a common culture give rise to constraints which constitute a moral code. Within the state many of the rules may emerge in common law, while at the international level customary international law provides the basis of international morality. While it is true that such thinkers as Grotius believed that the practices of states did indeed give rise to a law of nations, it was nevertheless compared with the natural law, and should not be in fundamental violation of it. The elements of this manner of thinking are brought out well by Jennifer Welsh in her discussion of Edmund Burke, one of the most enigmatic of international theorists (Edmund Burke and intervention: empire and neighbourhood). Welsh demonstrates both the pragmatic appeal to universal principles, when Burke wanted to indict Warren Hastings, the Governor General of Bengal, of flagrantly violating the principles of the British constitution, the cultural and political traditions of India, and the universal laws of morality. Arbitrary government, he went as far as to suggest, was both dangerous and unnatural. When it came to Europe, however, Burke worked very much within the paradigm of historical reason. Europe had a common civilisation based on religion and the manners of a gentleman, with shared practices and sympathies. Self-imposed constraints had made war altogether a more civilised, if necessary form of conduct. The threat posed by the French, deluded by universal principles of natural right, to the ‘Commonwealth of Europe’ constituted a danger to the customary law of Europe. This law was manifest in such institutions as the balance of power, violation of which threatened, the safety and peace of its inhabitants, giving just cause for war, which extended both a right and duty to intervene militarily on humanitarian grounds. These arguments are best considered in Burke’s writings on the regicide peace, when the imminent danger to Europe loomed largest. Welsh, quite rightly, emphasises this “historical” morality when she argues that “Burke’s law of nations did not apply universally, but only to those countries which actively participated in Europe’s common civilisation” (226). Nations and territories outside of Europe, such as the Ottoman Empire were deemed outside of the community of rights and duties that constituted Europe, which did not make them immune from being judged by those standards. What the book is missing is a thorough-going consideration of how the law of nations and early international law, implicitly, and sometimes explicitly, stratified the world into gradations of civilisation, but also divided the globe spatially into different spheres. The implications need to be drawn out of Carl Schmitt’s powerful contention that ‘continental European international law since the sixteenth century, the jus publicum Europeaum, originally and essentially was law among states, among European sovereigns.’ The effect was that the world was divided between the old European world whose order was maintained by the public law of Europe, and the newly emerging new world that considered free space ‘open to occupation and expansion’. In conclusion, then, we may detect in the history of international theory that within the three broad ways of thinking about intervention general principles are invoked, and these general principles are articulated at varying levels of generality, universal in the case of those who subscribe to the ideas of will and artifice, but highly particularistic in its implications. There is no common good, only specific interests that may pragmatically converge or just as easily diverge. Those who subscribe to something like the idea of an historically evolving reason, are capable of viewing an evolving moral community, that in the period covered by this book constitutes Europe, with rather tenuous attempts to extend it to the Americas, Australasia and Africa. Those principles that purported to be universal, never were, because being human was a fundamental qualification for enjoying such rights, and what was at issue was what constituted being fully human. Women, in particular, fell, and in vast parts of the world still fall, foul of this criterion. In the wake of U.S. military interventions in Afghanistan and Iraq, and with many in the international community calling for action in the ongoing humanitarian crises in Syria and elsewhere, the issue of intervention is high on the international agenda. Scholars, writers, and policymakers are struggling to articulate a set of standards for international intervention that balance respect for state sovereignty with the need to safeguard the rights of individuals. Just and Unjust Military Intervention makes an interesting contribution to this debate by bringing together analyses of a diverse group of historical thinkers who have all addressed the question of intervention in some form. According to the book’s editors, Stefano Recchia and Jennifer M. Welsh, debates over foreign military intervention have historically turned on two questions. First, under what conditions is intervention legitimate? Second, what are the likely effects of intervention on both the intervening and target states? Recchia and Welsh’s introductory chapter discusses the potential problems in taking the writings of classical European thinkers out of the historical context in which they were embedded and applying them to modern international issues, but concludes that these texts can still contribute to our contemporary understanding of intervention. An informative chapter by David Trim discusses the linguistic and conceptual origins of the term ‘intervention,’ and traces how the practice evolved in Europe, beginning with interventions on behalf of co-religionists in the sixteenth century, and continued even after the Westphalian system of sovereignty came into effect in the seventeenth century. Subsequent chapters explore how individual thinkers approached the question of foreign intervention. This format allows for a very focused comparison across a diverse group of thinkers not normally considered together. Several chapters explore theorists who are often overlooked by contemporary international relations scholars, such as John Locke, Edmund Burke, and John Stuart Mill. I’d like to highlight one additional theme in this collection of essays. Many of the chapters focus on the ways in which classical thinkers evaluated foreign intervention based on theories of justice or by developing moral or ethical criteria for when the norm of nonintervention should be violated. Yet many of these thinkers’ judgments also relied, explicitly or implicitly, on causal theories of the likely outcomes of foreign interventions. In the chapter on Mill, for example, Michael Doyle highlights the “consequentialist character of the ethics of both nonintervention and intervention” in Mill’s writing, and that “it makes a difference whether we think that an intervention will do more good than harm” (264). Similarly, Recchia writes that Giuseppe Mazzini recognized that “principled morality in international relations always needs to be combined with a more prudential type of reasoning, to have a realistic chance of improving the human condition in a highly imperfect world” (262). In my reading, the main consequentialist arguments regarding whether foreign military intervention can foster meaningful liberal change in the economic and political institutions of targeted states evolved over the period covered in the book. Many of the theorists in the book were pessimistic on this question, but differed in their explanations as to why. Eighteenth century theorists such as Adam Smith, David Hume, and Edmund Burke seem to have stressed the importance of deep economic and cultural conditions in their view that imperial interventions were unlikely to become vehicles for liberal change in foreign societies, while also highlighting the illiberal internal effects of prolonged interventions on the European imperial powers themselves. Extrapolating from Hume and Smith’s economic writing, Edwin van de Haar’s chapter describes their view that societies pass through stages of economic development, but that progress through these stages cannot be expedited by external intervention. Instead, Smith and Hume believed that free trade and other forms of peaceful international exchange were more likely than coercion to advance individual liberty in illiberal societies. In the case of Burke, although he favored military intervention during the French Revolution and criticized abuses of power within the British empire, he believed that liberal values were not universal, but were built on a particular European cultural and civilizational foundation. Burke was therefore pessimistic that liberal values could be spread to or sustained in states that lacked this social background. Welsh suggests that from a Burkean perspective it is unsurprising that “The liberal zone of peace today largely remains culturally bound” (236). Mid-nineteenth century liberal thinkers such as John Stuart Mill and Giuseppe Mazzini offered a different theoretical perspective on intervention and liberalism. Both addressed the question of intervention in the context of European self-determination movements challenging multi-national states and empires. In Recchia’s account, Mazzini advanced several distinct causal arguments explaining why military interventions on behalf of national self-determination movements (and pro-democracy movements in general) were unlikely to result in democratic change: great powers often have mixed motives for intervening; leaders brought to power by foreign forces may become dependent on external support and thus discredited or find they are unable to build their own domestic coalitions; and self-government could not be sustained unless it was achieved by the effort and sacrifice of a political community. Mill developed a very similar causal logic in defending a general policy of noninterference, writing that “The liberty which is bestowed on [a people] by other hands than their own, will have nothing real, nothing permanent” (quoted on 251). These chapters highlight a central tension in liberal internationalism between a commitment to noninterference and a commitment to universal liberal goals such as strengthening human rights, building more democratic political institutions, and preventing or halting state-sponsored violence against civilians. Yet we currently lack a well-developed set of theories on the conditions under which military intervention or other forms of international coercion are likely to advance these liberal goals. By exploring how European thinkers approached this question in past eras, Just and Unjust Military Intervention will contribute not only to building a richer contemporary moral theory of intervention, but to a better understanding of the practical consequences of intervention as well. As editors, Stefano Recchia and Jennifer Welsh have set themselves and the contributors to Just and Unjust Military Intervention a difficult task: speak to the present by reviewing the work of a series of European thinkers, dating from the early decades of the sixteenth century to the mid-nineteenth century. On the one hand, Recchia and Welsh hope “not to uproot the classical thinkers’ arguments from their social, political, and intellectual environment.” On the other hand, they assume that “re-reading the classics can assist us”—themselves and the rest of us—“in developing our own approaches to the particular dilemmas surrounding intervention in our own time” (20, their emphasis). Are these goals—contextual sensitivity and contemporary relevance—even compatible? The editors argue that we should not worry on this score, and for three reasons. First: “From the sixteenth century onward, princes and states have sent their troops to fight in foreign lands against the will of foreign rulers, and in many instances the justification for doing so has been the appalling acts of those local rulers” (6). I will return to this well-taken point later. For now I will confine myself to two observations: It tells us nothing about the problem of uprooting classical thinkers—if anything, it implies there is no problem because the reason for intervention has never changed. Yet the phrase “princes and states” glosses over a significant shift, even a disjuncture, in agency—the “person” sending troops has changed, even if the reason has not. Second: “the particular thinkers showcased here have all played an important part in constituting the kind of international society we have today—one that is now based on a universal ideal of sovereign equality, but which evolved from a European ‘core’ and still has embedded within it notions of hierarchy and exclusion” (7). However apt this quick and dirty characterization of international society (I like it pretty well), we should not take for granted that our showcased thinkers “played an important part” in its constitution. Certainly not all of them did, at least not directly. Arguably few indeed did so, if we go by what they actually said and who, in that context, might have listened. Insofar as later writers invoke earlier ones, we are better able to see the constitutive process at work. I suspect this happened less often than we would like to think, despite, for example, Immanuel Kant’s offhand remark about sorry comforters. When later writers did invoke earlier ones, they tended to do so selectively, anachronistically, producing an interpretive patchwork to support a judgment in the context of the later moment. What we end up seeing is a cumulative change in opinion over an extended period of time, to which we then add our own anachronistic judgments, with a cumulative effect on what people do. Constitutive processes often foster an interpretive bias that is distinctly Whiggish and so very characteristic of the contemporary discourse on intervention: things are getting better, though (as Kant foresaw) it has not been easy. Third: “participants in current debates over the legitimacy of military intervention, whichever side they endorse, can benefit from consulting the arguments of classical European philosophers and jurists” (8). What kind of help are we talking about? Since debates are exercises in competitive persuasion, participants will get the most help from revered thinkers by dropping names and digging around in texts for relevant tidbits. These are, of course, familiar moves in many constitutive processes—all too familiar in contemporary academic circles and courts of law. Recchia and Welsh realize that they must find something more going on than this, or they will have abandoned context in favor of relevance. Their solution is to identify two issues as relevant today as they were for classical thinkers: “what is the legitimate basis for intervention?” and “what is the likely impact of intervention and what are the associated risks?” (8). The first question effectively repudiates the first reason the editors give for not worrying when we go all the way back to the sixteenth century: whatever the context, the justification for intervention has never changed. If indeed legitimacy is the issue, then context matters; diverse thinkers are unlikely to agree in principle, and certainly not in detail, on such issues. The second question implies that an ever-changing context will permit nothing more than a factual assessment of any given intervention; whatever else thinkers might have to say is beside the point. As framed, both questions are timeless only because of their abstract formulation. The first and third reasons the editors offer for their project effectively decide in favor of timeless relevance. The second reason leans toward context but only because the editors argue that European thought exhibits a progressive tendency. The question of compatible goals remains unanswered. Does the book itself—a work of careful scholarship and considered judgment—do what the editors have not? Do its contributors manage to avoid anachronism and still find relevance in what their thinkers have to say? Taken together, do their contributions effectively confirm the progressive bias that I see driving the project, or do they tell another story? In my view, all of the contributors honor the first goal; they are quite properly wary of anachronism. Most of them fail in the second goal. Not for lack of trying: everyone takes a stab at establishing the contemporary relevance of the thinker or (in a few cases) thinkers they write about. Yet there is something ad hoc, even half-hearted in these efforts. None of the contributors so much as hints that she or he has found a missing key to present dilemmas. There is, after all, no debate going on, no one to score points against, no chance of a dramatic win, no incentive to make any such claim. Vitoria might provide a starting point for thinking about saving the innocent in contemporary international relations, but his notion of a rationally ordered Christian universe in which man is created in the image of God is largely unintelligible today, at least on a global scale (94-5). The similarities between post-Napoleonic Europe and contemporary international society—combined with Mazzini’s thoroughly modern effort to square a strong belief in national sovereignty and independence with an equally deep commitment to human dignity and equality—may explain why so many of his arguments appear so familiar today (261). One might suppose that there is a regular progression in intelligibility and familiarity from Francisco de Vitoria in the early sixteenth century to Mazzini in the mid-nineteenth, and thus that the book as a whole is more Whiggish than its contributors. Perhaps surprisingly, this is not the case. Instead there in an alien “before” (Vitoria, Francisco Suarez and Alberico Gentili), soon, even suddenly, giving way to a long, tumultuous period ushered in by Hugo Grotius (b. 1583) and still haunting G. W. F. Hegel (b. 1770) two centuries later, and then, again suddenly, a familiar “after” (Mazzini, b. 1805; Mill, b. 1806). The thinkers in between—(in order of birth) Thomas Hobbes, Samuel Pufendorf, John Locke, David Hume, Jean-Jacques Rousseau, Emmerich de Vattel, Adam Smith, Kant, and Edmund Burke—partake in the great transformation from a smallish, status-ordered world of European princes to a world of sovereign states occupying vast stretches of territory across several continents. This transformation—this coming of the modern age—was an event with so many tangled strands as to elicit wildly different responses—even from the same thinker at different moments. Some of us would divide the transformation more or less by century, thus lumping together Grotius, Hobbes, Pufendorf, Locke (d. 1704) and then Hume (b. 1711), Rousseau, Vattel, Smith, Kant and Burke. Yet even this contrivance (early modern period, then Enlightenment) does little to reduce the ambiguity in perspectives and cacophony of voices. Vattel offers a good example. Among the most lucid of writers (or, as critics have said, prosaic of thinkers), Vattel titled his hugely influential treatise of 1758 Droit des gens; ou, Principes de la loi naturelle appliqués à la conduite et aux affaires des nations et des souverains. His concern with the actual conduct of relations anticipates legal positivism despite his claimed allegiance to natural law; that concern reaches back to crowned heads as living sovereigns and forward to nation-states as sovereign abstractions. A difficult writer, Kant is perhaps the best example of all. On Andrew Hurrell’s account, “Revisiting Kant and intervention,” Kant’s work reveals “unresolved tensions” that make him important in our own disordered time (217-18). Less charitably, I would say that Kant’s disordered obscurities minimized his impact as a social theorist in his own time, and that we hardly need reminding that we too face unresolved tensions. With 150 years of hindsight (John Stuart Mill penned “A Few Words” in 1859; European powers had rejected intervention in the US Civil War by 1864), we can generalize about the great transformation in a way that Kant and his contemporaries could not. Three features stand out. First is the principle of natural equality manifest in the reciprocal relation of rights and duties, instantiated as sovereign equality, and then substantiated within and among sovereign states as liberalism. Second is the rise of romantic sentiment, instantiated in the nation and substantiated as the self-determining nation-state. Third is the rise of positivism, in law displacing naturalist teleology with a clear, practical separation of the domestic and the international. Despite their latent contradictions, all three features of modernity’s emergence persist today. In my view, they account for the contentious character of the contemporary discourse on intervention. We are no longer as confused as Kant was. We simply disagree on which feature of modernity’s potent brew to honor and promote. With so much having changed, has everything changed? Recchia and Welsh suggest that the “appalling acts of … local rulers” (6) have always justified intervention. They may be right, but not in any straightforward way. According to David Trim in his chapter, “Intervention in European history, c.1520—1850,” early modern princes were justified in intervening when some other prince behaved tyrannically—atrociously, appallingly—toward their own people (25-7). Anachronistically we might call the motivation for this kind of intervention a humanitarian impulse or concern; Trim sees the motivation as a concern for the common good. I suggest that status concerns motivated princely intervention. Princes who ordered or even condoned massacres, atrocities, and other appalling acts violated “their subjects’ established liberties and privileges” (26) and thus abused the liberties and privileges of their own high station. Such acts were vicious in the fullest sense—gratuitous, unseemly and so deeply embarrassing to other princes that they, and they alone, could properly intervene, albeit “with utmost reluctance” (Trim again, 45). By the same token, the European status order denied anyone else the necessary liberties and privileges to restore its integrity. When Richard Tuck says in his chapter, “Grotius, Hobbes, and Pufendorf on humanitarian intervention,” that “the reluctance on the part of Protestant theorists”—John Calvin, Gentili, Grotius—“to concede a right of armed resistance to citizens had the paradoxical effect that they put much more stress on the right of foreign intervention by a foreign ruler than did the scholastics” (102), I see no paradox. For the scholastics, the issue of resistance was abstractly formulated and far removed from worldly affairs. With the onset of religious war, Catholic princes committed appalling acts against Protestant subjects—an unacceptable turn in worldly affairs. In the circumstance, Protestant thinkers favored intervention by Protestant princes over resistance by Protestant subjects because intervention ended tyranny while supporting the prevailing social order; as Martin Luther realized, peasant wars endangered the larger status quo. In the end, resistance won out. The great transformation shattered the old order and culminated in the age of revolutions. Today we condemn tyrants and their appalling deeds, we call them criminals personally responsible for their acts, we applaud their victims for their resistance, we come to victims’ assistance reluctantly, we cheer when tyrants fall from office and, even more, from what our predecessors would have called their exalted station. Much has changed over the centuries, including our conception of agency, but not a moral sense that privilege has its limits. David Boucher, Jonathan Monten, and Nicholas Onuf have engaged productively, and critically, with our collection of essays on early modern European thought about military intervention. That engagement in many ways validates our initial goal: to encourage renewed reflection on how military intervention has been conceived and debated from as early as the sixteenth century at a time when the discourse around intervention is so passionate and morally charged. The reviewers raise a set of methodological and substantive issues, whose further discussion will serve to enrich future research on both the particular thinkers highlighted in our volume and the specific questions that concerned these writers. Our wager in the book is that it is possible to analyze ‘classical’ thinkers in a way that can inform – and indeed strengthen – our own efforts to grapple with the ethical dilemmas raised by military intervention. But in doing so, we strove to avoid distorting those thinkers’ intentions. In short, we reject both of the extremes set out by Alasdair Macintyre in his discussion of the relationship of philosophy to the past: i.e., that we can either read philosophical works with an effort to make them relevant (and thereby misrepresent them), or we can read them on their own terms (and thereby preserve them as “museum pieces”). As we note in the book’s introduction (20), our goal is not to confirm or legitimize current assumptions about intervention by identifying superficial similarities with the arguments of early modern thinkers, but rather to rely on the classical thinkers to stand back from present-day intellectual commitments and thus explore the possibility of reconceptualizing and reappraising contemporary problems. Onuf, while judging favorably our efforts to avoid anachronism, wonders how effectively our contributors have established contemporary relevance. Yet perhaps Onuf conceives of “relevance” in too narrow a sense when pointing out that “none of the contributors so much as hints that she or he has found a missing key to present dilemmas.” The book’s main objective, to reiterate, is to get current readers to think differently about present dilemmas, and highlight how social and political circumstances as well as the broader normative context may influence one’s answers, rather than to provide ready-made solutions for particular contemporary problems. One may further ask why the particular early modern thinkers we chose should be exalted as a valuable window through which to examine current debates and dilemmas. Our selection is undoubtedly incomplete, and it reflects our own judgment about what kinds of arguments are powerful and long lasting. Nevertheless, the selection is not wholly subjective or random. Quite simply, we chose those particular thinkers because of the quality and impact of their writings. Onuf challenges our claim that the thinkers we selected had a noticeable impact on the shape and evolution of international society. “Certainly not all of them did,” Onuf argues, “at least not directly.” Establishing the impact of ideas on the evolution of political practice is notoriously difficult. We agree with Onuf that some of the thinkers presented in the volume may have been more influential than others. Francisco de Vitoria and Emmerich de Vattel most readily come to mind as two thinkers who did serve as important sources and inspiration for the arguments and policies of those who came afterward. We also take Onuf’s point that writers over the centuries have selectively “grabbed” from the pens of those who came before, and that changes in opinion have therefore been cumulative. Perhaps our argument in the book’s introduction was not sufficiently clear in this regard. We simply reject the crude materialist argument according to which the ideas prevailing at a particular time are merely epiphenomena of particular economic, political, or technological circumstances, unaffected by the arguments of earlier generations of thinkers whom today we recognize as ‘classical’ or ‘canonical.’ In short, we work on the assumption of multiple feedback loops between the world of ideas and the world of political practice. On questions of substance, Onuf correctly identifies our slide from talking of “princes and sovereigns” to talking of “states.” The agent engaging in intervention does matter, and the question of statehood – and its relationship to the nation – is probably given too little attention in our volume. It does explicitly come up only in later chapters, notably those on Giuseppe Mazzini and John Stuart Mill, two nineteenth-century writers who thought deeply about the relationship between the state, the nation, and popular self-determination. But the time period covered in the book – early sixteenth to mid nineteenth century – was chosen for a particular purpose: while older forms of political organization continued to exist for much of this period, it was also the period during which sovereign states in the modern sense (and the corollary of statehood, a prima facie right to non-intervention) first emerged and became progressively consolidated in European international society. For his part, Boucher makes the important and valid observation that our volume does not take a sufficiently ‘macro’ perspective, and he reminds us that the assumptions and frameworks that informed the views on intervention of the thinkers we selected simultaneously stratified the world into gradations of civilization. More generally, his point should be taken as a correction to the ‘expansion’ thesis in international relations, which depicts a coherent European international society that expanded, through the vehicle of imperialism, to eventually unite the whole world into a single economic, strategic, and political system. Following Boucher’s lead, we would agree that that we should think less in terms of “who became part of international society and when,” and more in terms of how various entities fit within a broader international order at different points in time. While many of the thinkers in our volume wrote about the relatively closed group of states, or ‘family of nations,’ that coalesced around certain institutions, rules and values, this European ‘core’ was only one part of a larger social order, in which there were multiple entities (some states and some not) and various kinds of interaction among them. Indeed, Christopher Bayly’s analysis of globalization and modernity takes these connections and interactions as its starting point, challenging the notion that Europe’s ideas and material resources were in the driver’s seat during the era typically characterized as “European expansion.” It is a fair criticism to say that our presentation of the views of European thinkers on military intervention does not help us to see the kind of multicentered world that existed prior to the twentieth century. Finally, Jonathan Monten draws our attention to one important reason why the thinkers we selected are still worth consulting. Apart from their engagement in moral critiques or defenses of non-intervention, those writers also developed causal theories about the likely impact of intervention (on both the intervener and the ‘target’ society) that may still be relevant today. In particular, and in spite of their sometimes enthusiastic support for European colonialism, many of the thinkers covered in our volume expressed a healthy dose of skepticism concerning the ability of military intervention to achieve lasting political change abroad. Eighteenth-century thinkers like Adam Smith, David Hume, and Edmund Burke stressed that a society’s political institutions need to reflect its deep economic and cultural conditions, and they also highlighted the corrupting effect of protracted interventions on the interveners themselves. Meanwhile, nineteenth century liberals like Mazzini and Mill emphasized that democratic self-government could not be sustained unless it was achieved by the effort and struggle of a political community. Contemporary liberal and neoconservative crusaders who selectively draw on the authority of classical thinkers to justify neo-imperialist projects of ‘regime change’ and ‘nation-building’ abroad might benefit from paying greater attention to this perhaps less well known, consequentialist aspect of early modern thinking about military intervention. In conclusion, we would like to thank Boucher, Monten, and Onuf for their insightful, generous reviews, and for highlighting potential avenues along which the debate might be carried forward. The verve they display in debating our arguments bears testament to the richness of classical European thought about war and intervention, and to the continuing relevance of the writers we selected as a useful starting point for thinking deeply and critically about the ethics of military intervention. R. G. Collingwood, An Autobiography and other writings, ed., David Boucher and Teresa Smith (Oxford: Oxford University Press, 2013), 61-3; and Q. Skinner, “The rise of, challenge to and prospects for a Collingwoodian approach to the history of political thought,” in Dario Castiglione and Iain Hampsher-Monk (Cambridge: Cambridge University Press, 2001), 175-88. Michael Oakeshott, Hobbes on Civil Association (Oxford: Blackwell, 1975), 3-8. R. G. Collingwood, The Idea of History, new edition, ed. Jan van der Dussen (Oxford: Oxford University Press, 1993). Quentin Skinner, Liberty before Liberalism (Cambridge: Cambridge University Press, 1998), 117. Lewis Hanke, Aristotle and the American Indians: A Study in Race Prejudice in the Modern World (Bloomington: Indiana University Press, 1959), 41. Juan Ginés de Sepúlveda, Apology for the Book On the Just Causes of War: Dedicated to the Most Learned and Distinguished President, Antonio Ramirez, Bishop of Segovia, trans. Lewis D. Epstein (unpublished, Bowdoin College, USA, 1973), 18. Lewis Hank, All Mankind is One: A Study of the Disputation Between Bartolome de Las Casas and Juan Ginés de Sepúlveda on the Religious and Intellectual Capacity of the American Indians (DeKalb, Illinois: University of Illinois Press, 1974), 86 and 118. Carl Schmitt, The Nomos of the Earth in the International Law of the Ius Publicum Europeaum, trans. G. L. Ulmen (New York: Telos, 2006), 126. Schmitt, Nomos of the Earth, 87. “Introduction: The Enduring Relevance of Classical Thinkers,” 1-20. “Intervention in European History, c. 1520-1850,” 21-47. “J.S. Mill on Nonintervention and Intervention,” 263-287. “The Origins of Liberal Wilsonianism: Giuseppe Mazzini on Regime Change and Humanitarian Intervention,” 237-262. “David Hume and Adam Smith on International Ethics and Humanitarian Intervention,” 154-175. “Edmund Burke and Intervention: Empire and Neighborhood,” 219-236. Alasdair Macintyre, “The relationship of philosophy to its past,” in Richard Rorty, J.B. Schneewind, and Quentin Skinner, eds., Philosophy in History (Cambridge University Press, 1984), 31-48 (p. 31). Hedley Bull and Adam Watson, eds., The Expansion of International Society (Clarendon Press, 1984). Edward Keene, “The standard of ‘civilisation,’ the expansion thesis and the nineteenth-century international society space,” Millennium 42 (3), 651-73. Christopher Bayly, Birth of the Modern World, 1780-1914 (Wiley-Blackwell, 2004).